Crumbling, stone walls settled on a carpet of bright green grass, surrounded by the bronze of a beech hedge. Beyond, a dark river slowly meanders through an open park, flanked by deep green ivy covered trees and tangles of brambles. Welcome to the Priory an old monastery worn away by time and nestled in the bustle of Thetford. It was here that we spent the morning once again battling through branches, spikey bushes and curtains of ivy in search of birds nests. 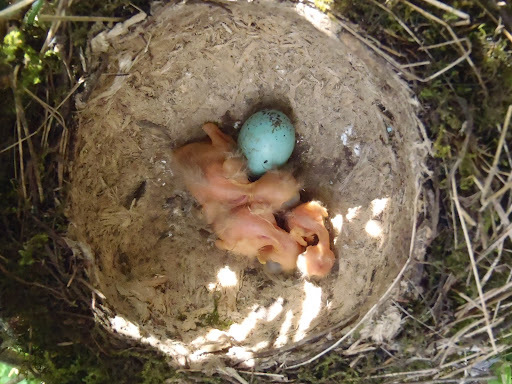 And again we were successful, with a total of 13 new nests of song thrush, blackbird, wren, robin, Canada goose, moorhen, dunnock, collared dove and woodpigeon. But this is not the full story, or the tale I have to tell…. 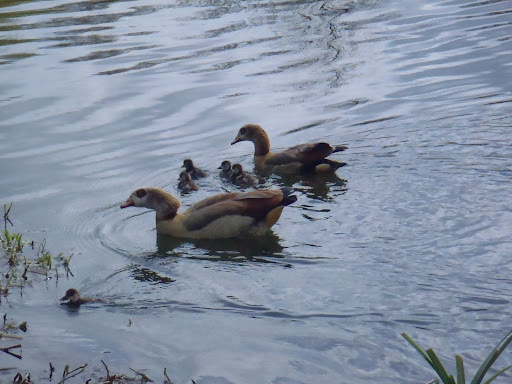 Following the river, we passed a pair of Egyptian geese and their three young goslings. 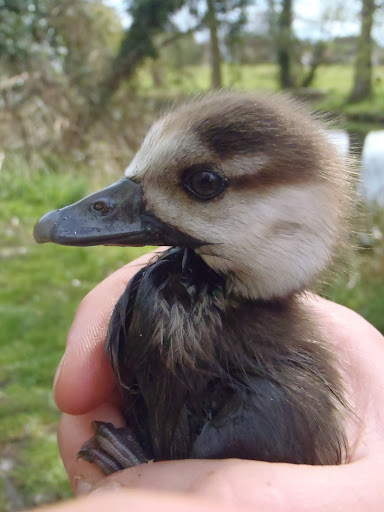 Distinctive and exotic looking, the Egyptian goose was introduced as an ornamental species, but having escaped now successfully breeds in the wider countryside, predominantly in East Anglia. Further down river on the bank we came across two more goslings, but with no parents in sight, it soon be came apparent that these little guys had been left behind. Lost, calling out, but not to be heard by the adults who had passed a weir and were far up stream, there would be little chance of a reunion…. We acted quickly and instinctively, grabbing one of the goslings as they made a break for the river. The second struck out for the opposite bank, but with a bridge nearby we soon caught up and grabbed him too. Returning back up river, we soon found the family again and with a little splash had managed to reunite the two rescued goslings with mum, dad and siblings.